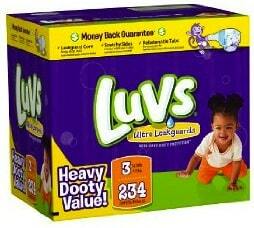 Size 3 Luvs Ultra Leakguard Diapers for $0.13 or $0.15 Each! Amazon has a nice price on size 3 Luvs Ultra Leakguard diapers. You can get 234 diapers for $30.39 with an Amazon Mom membership when you order with Subscribe & Save. That's $0.13 per diaper! If you're not an Amazon Mom, you can still get the diapers for $36.09. That's still only $0.15 per diaper! Remember, you're under no obligation when you order with Subscribe & Save. I usually place all my orders with the Deliver Every field set to 6 months. As soon as my order ships, I go into my Amazon account and cancel the subscription.